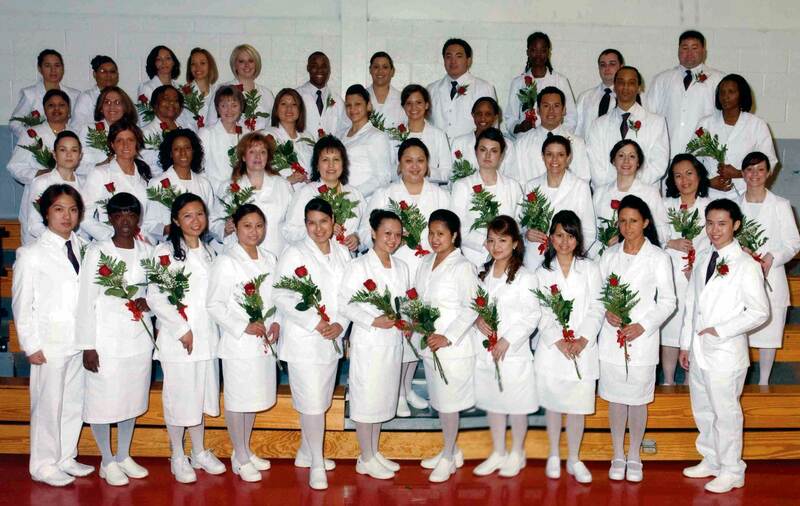 New Nurses—Forty-four new graduates have joined the ranks of the nursing profession following their completion of studies at the Trinitas School of Nursing. Among the men and women who received school pins, diplomas, and degrees were: Christine Olivia Agumbah of Elizabeth; Michelle Anahory of Hillside; Rachel Joy C. Azcarraga of Old Bridge; Junn Michael E.Bautista of Union; Ives Marie G. Cabezas of Union; Carmela J. Carlos of Union; Erica Alissa Castagliola of Staten Island, New York; Selande G. Charles of West Orange; Kristen Ann Colla of Union; Catalina Cordero of Linden; Waleska Lynn Diaz of Roselle; Kimyada Drake of East Orange; Yaniry Espinal of Union; Leilani J. Evangelista of Dunellen; Sandra Patrica Fonseca of Elizabeth; Jolita Girdeniene of Elizabeth; Blana Liz Gomez of Newark; Danielle L. Gritenas of Kenilworth; Taquana Latrell Holley of Linden; Alekandr B. Kamenetskiy of Springfield; Judy M. Legendre of Ozone Park, New York; Jamie Kristine Mananghaya of Jersey City; Nastasha Prin T. Marasigan of Union; Melissa Marie Mendez of Staten Island, New York; Particia Mendez of Elizabeth; Rowena Naeseth of Westfield; Evelyne Ongwae of North Plainfield; Donn C. Orellana of Linden; James Earl Pagaduan of Bergenfield; Nicole Marie Paonessa of Rahway; Donna M. Parker of Linden; Josue S. Petit-Frere of Elizabeth; Hedwig Ratemo of Union; William Carl Ricci of Westfield; Melinda K. Roman of Linden; Magdalena Samborski of Union; Christian Sanchez of Berkeley Heights; Jessica M. Stabile of Cranford; Willie E. Thomas of Elizabeth; Jessica Paula P. Uy of Jersey City; Vanessa Mary Valencia of Staten Island, New York; Linda Vera of Belleville; Michelle Wynter of Union, and Esperanza Zayas of North Bergen. Nicole Maria Paonessa of Rahway was the recipient of nursing high honors. Those awarded nursing honors were: Christine Olivia Agumbah, Catalina Cordero, Waleska Lynn Diaz, Blanca Liz Gomez, and Hedwig Ratemo.